We are inspired by the Salazar family who, through our Create a Commuter and Holiday Bike Drive programs, earned bicycles and can now ride together as a family. Stories like this are possible through the commitment of supporters like you. This winter, support new riders by joining the Community Cycling Center in broadening access to bicycling for all Portlanders. Our goal is to raise $147,000 between November 1st to December 31st. 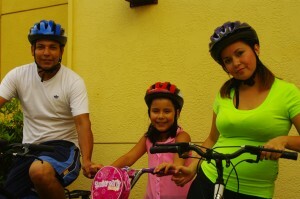 Funds raised during this campaign will go toward all of our innovative programs that connect families, friends, and neighbors by bicycle. This year, hundreds of children and adults will earn bicycles and the training they need to ride safely in their communities. Please join us to ensure that all Portlanders have access to the benefits of bicycling. You can make a gift online, at our bike shop, or give us a call at 503-288-8864 ext. 334. SAVE THE DATE: Our Holiday Bike Drive Sneak Peek will happen on Wednesday, December 4th! Join us to hear more about what’s in store at this year’s Holiday Bike Drive, enjoy food and drinks, and receive up to 30% off in our bike shop!